The so-called student loan crisis in the U.S. is largely concentrated among non-traditional borrowers attending for-profit schools and other non-selective institutions, who have relatively weak educational outcomes and difficulty finding jobs after starting to repay their loans. In contrast, most borrowers at four-year public and private non-profit institutions have relatively low rates of default, solid earnings, and steady employment rates. With outstanding federal student loan balances in the U.S. exceeding $1.1 trillion — quadrupling over the last 12 years and more than any other type of household debt except mortgages – the research finds that most of the increase in default is because of an upsurge in the number of borrowers attending for-profit schools and, to a lesser-extent, community colleges and other non-selective institutions whose students had historically composed only a small share of student borrowing. By 2011, however, borrowers at for-profit and 2-year institutions represented almost half of student-loan borrowers leaving school and starting to repay loans, and accounted for 70 percent of student loan defaults. 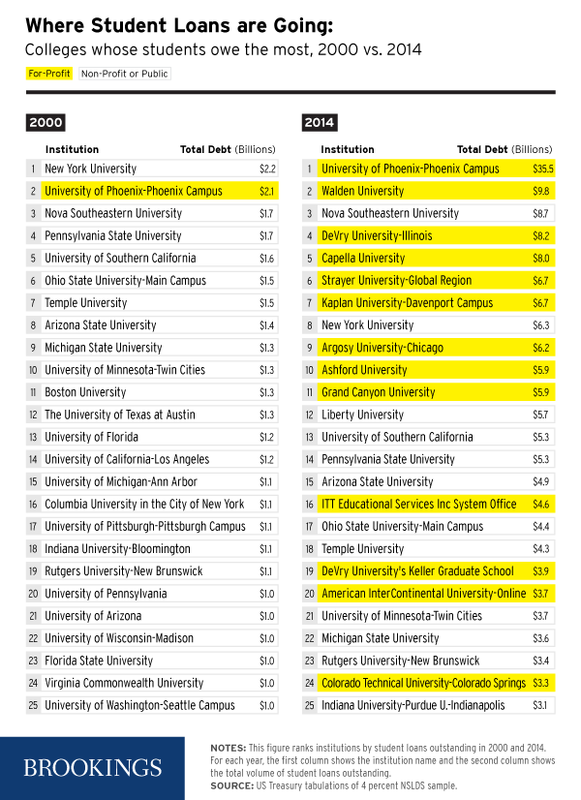 In 2000, only 1 of the top 25 schools whose students owed the most federal debt was a for-profit institution, whereas in 2014, 13 were. Borrowers from those 13 schools owed about $109 billion—almost 10 percent of all federal student loans. In “A Crisis in Student Loans? How Changes in the Characteristics of Borrowers and the Institutions they Attend Contributed to Rising Loan Defaults,” Adam Looney of the U.S. Department of the Treasury and Stanford’s Constantine Yannelis examine the rise in student loan delinquency and default, drawing on newly available U.S. Department of Education administrative data on federal student borrowing linked to earnings records derived from tax records. The sample includes 4 percent of all federal student borrowers since 1970—about 46 million annual updates on 4 million borrowers derived from hundreds of millions of individual records—and provides information on the characteristics of students, the institutions they attended, how much they borrowed, and how they fared after entering the job market. Increased enrollment in for-profit schools and increased borrowing rates among community college students account for much of the recent doubling in default rates, with changes in the type of schools attended, debt burdens, and labor market outcomes of non-traditional borrowers explaining the change, Looney and Yannelis find. “[These students] borrowed substantial amounts to attend institutions with low completion rates and, after enrollment, experienced poor labor market outcomes that made their debt burdens difficult to sustain” they write. More than 25 percent of them leaving school during or soon after the recession would default on their loans within three years. For example, the median borrower from a for-profit institution who left school in 2011 and found a job in 2013 earned about $20,900—but over one in five (21 percent) were not employed; comparable community college borrowers earned $23,900 and almost one in six (17 percent) were not employed. At the same time, the median loan balances of non-traditional borrowers had jumped almost 40 percent (from $7,500 to $10,500) for for-profit borrowers and about 35 percent (from $7,100 to $9,600) among 2-year borrowers – driven by greater financial aid eligibility and need, higher loan limits, cuts to state aid, the impact of recession on household finances, and increased tuition costs. These debt increases were much larger among non-traditional borrowers than for borrowers from 4-year public and private institutions, or for graduate borrowers. In other words, what type of institution students attend matters: default rates have remained low for borrowers at most 4-year public and private non-profit institutions, despite the severe recession and relatively high loan balances, the authors find. These students’ generally high earnings, low unemployment rates, and greater family resources appear to have enabled them to avoid loan repayment problems even during tough economic times. “Rising default rates among non-traditional borrowers could be overshadowing relatively beneficial investments in higher education, which may be less worrisome or even desirable,” they note. Looney and Yannelis note loan delinquency is likely to drop in the future, although with a lag of several years, thanks to several factors including a steep drop in the number of new borrowers at for-profit and 2-year institutions as economic conditions improved, and as oversight of for-profit institutions has been strengthened. Additionally, expanded eligibility and enrollment in income-based repayment, such as the Pay-As-You-Earn (PAYE) plan, which allows borrowers to suspend or make reduced payments when their income falls. Despite these improvements, however, many features of the federal loan system that contributed to today’s problems persist, they add. For instance, institutions whose students face weak economic outcomes and poor loan performance are largely insulated from any financial or other? consequences; certain borrowers may borrow very large amounts—often limited only by costs of attendance—contributing to increased risks and part of the reason for rising tuition costs; and many insolvent, largely non-traditional borrowers are mired in a system where they are unlikely to have the resources to repay their loans in full, and yet generally have no way to have those loans discharged.